Now in its tenth year, Melbourne Recital Centre’s Bach Competition, including the Newsboys Foundation Regional Music Award is dedicated to young musicians passionate about J.S. Bach. The competition repertoire needs to be any work of J.S. Bach not exceeding 10 minutes in total duration. Soloists and ensembles of up to five members who are 17 years of age and under (at 1 January 2019) are welcome to apply. Applications close on Wednesday 8 May 2019 at midnight and the finals will be held at Melbourne Recital Centre on Sunday 16 June 2019. 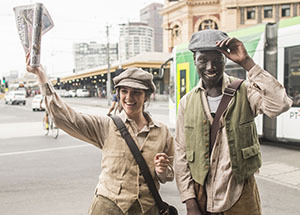 Students from a from rural or regional Victoria who attend a Victorian Government School are also eligible to apply for the Newsboys Foundation Regional Music Award. This prize is designed to enable such students to benefit from musical tuition and other opportunities that otherwise may be not open to them. It includes: travel and one week’s accommodation for the student and a parent/guardian in Melbourne and a daily per diem; lessons with a top teacher on the relevant instrument; complimentary tickets to concerts at the Melbourne Recital Centre during that week; mentoring/shadowing opportunities with Melbourne Recital Centre’s artistic and production staff and best endeavours to go ‘behind-the-scenes’ with direct contact with industry professionals.